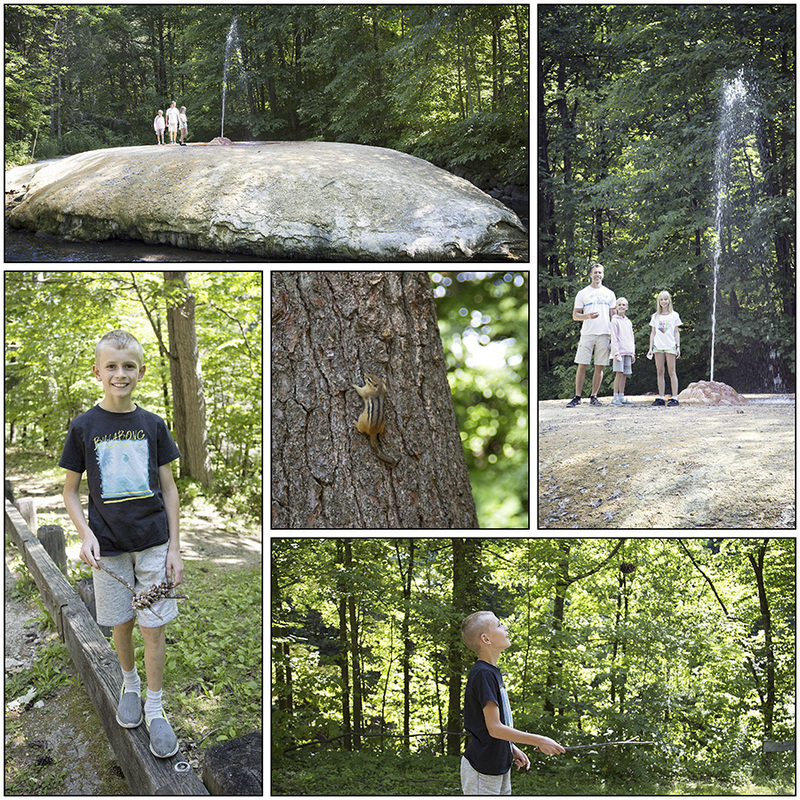 Our 2018 summer road trip started out in Saratoga Springs… (more text coming). 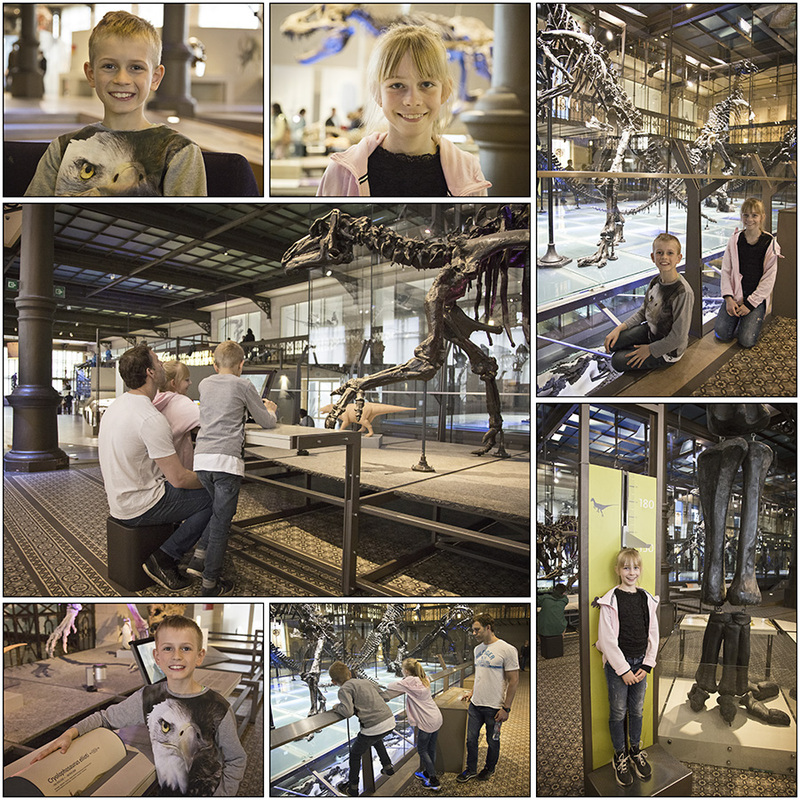 Brussels is full of museums and we checked out some of the ones the kids put on their to do list. 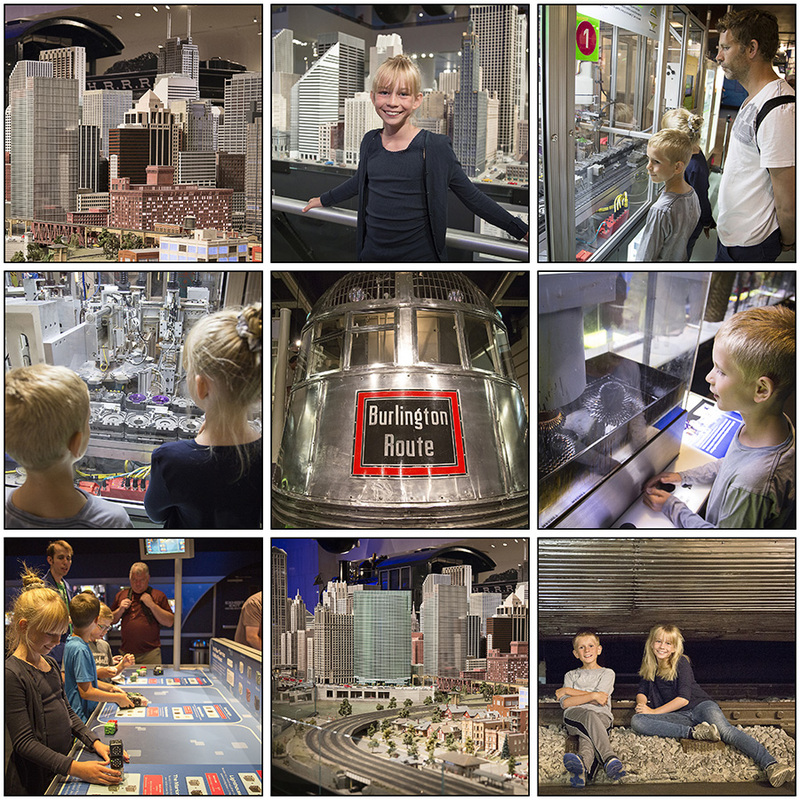 There was a really cool train museum showing the history of the railroads in northern Europe with some huge locomotives you could climb on and explore. 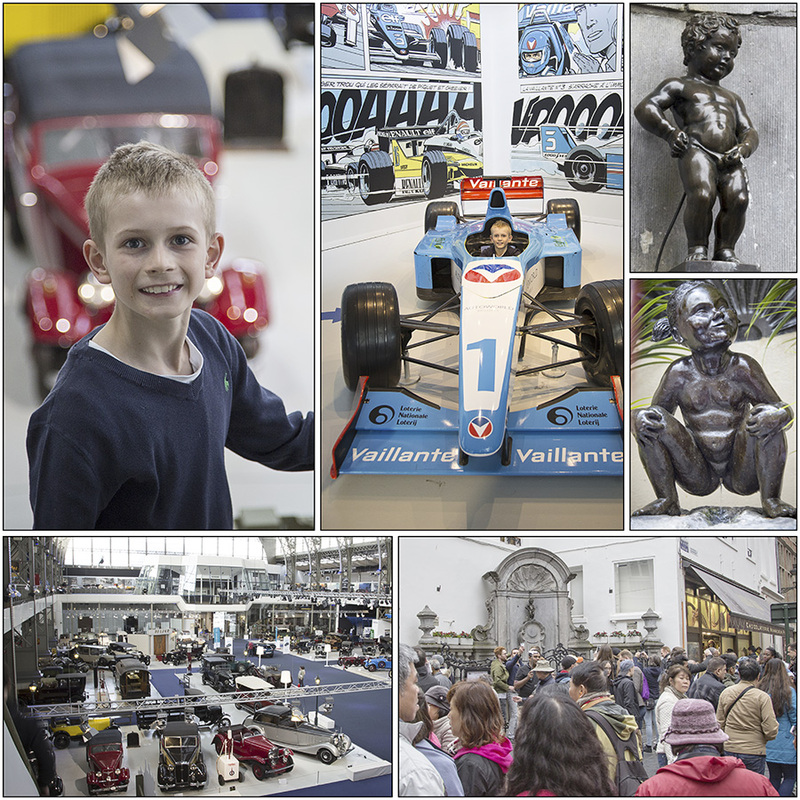 We also visited a car museum with cars from the Model T era to present time. 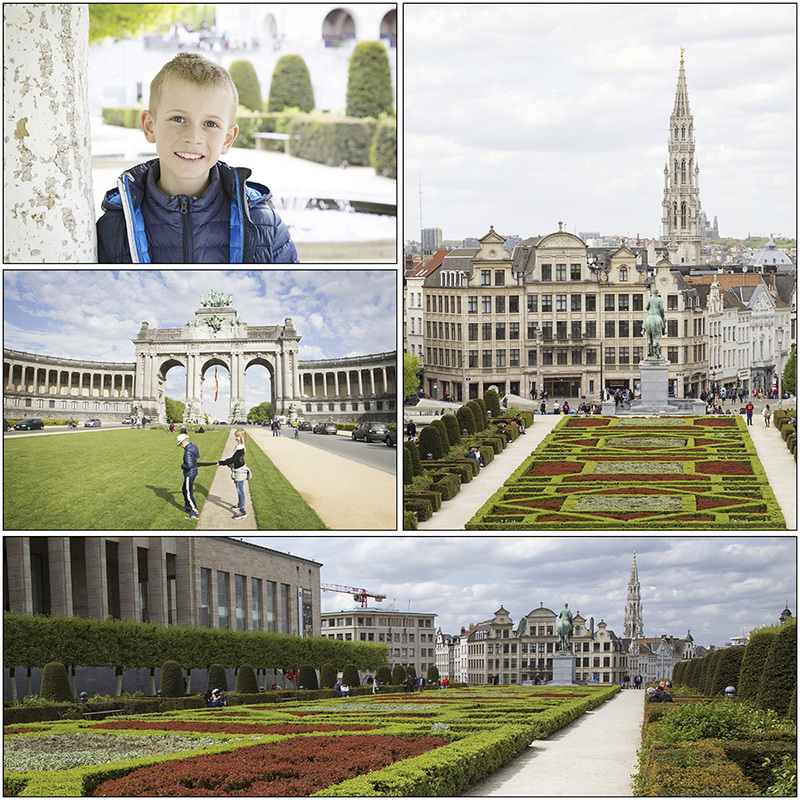 On our last day we visited Halle Gate, a more than 600 years old monument which houses a permanent presentation dedicated to the medieval City of Brussels. After Halle Gate we headed to the Museum of Natural Science which had a rather large collection of dinosaur skeletons, including the Cryolophosaurus ellioti which Elliot got a kick out of being named after. One of our very last stops on the trip was the Manneken Pis, a little statue of a boy peeing into a fountain. A consistent swarm of tourists taking pictures in front of the statue testifies to the fact that this little guy from 1619 is one of the most famous tourist stops in Brussels, believe it or not. His little sister, Jeanneke Pis, is by no means as popular, but we happened to pass by her during our explorations of the city. 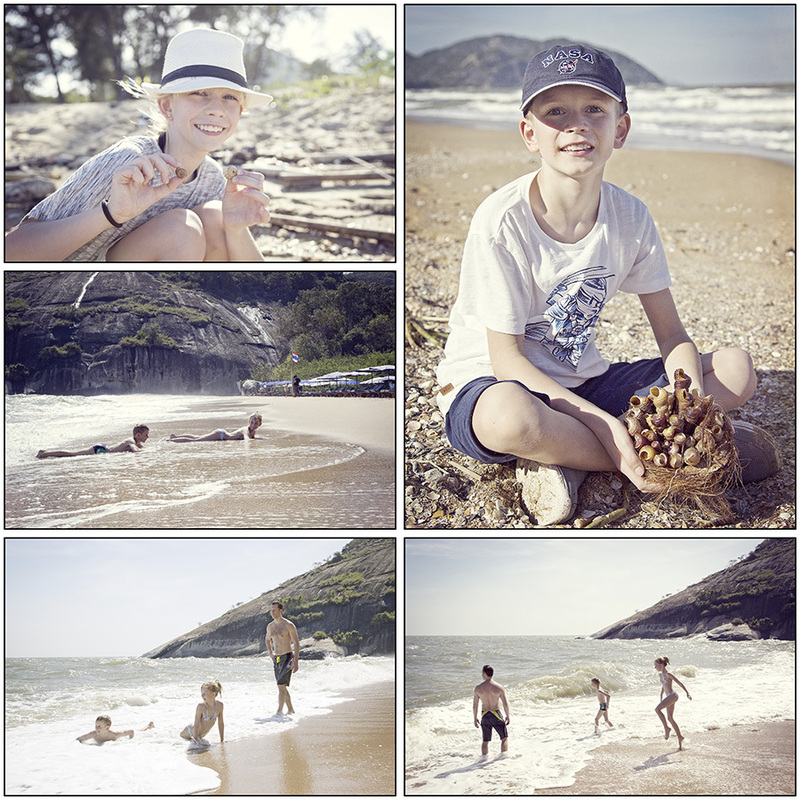 We lucked out on the weather which beforehand was warning of showers throughout the day. 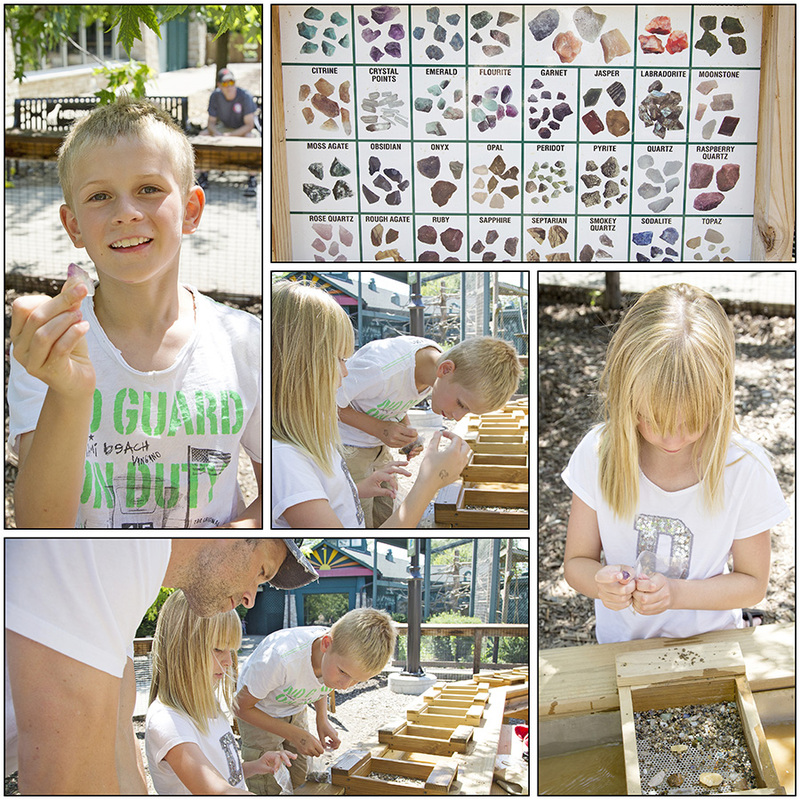 So we had good opportunities to explore the many cultural and green areas of the city. 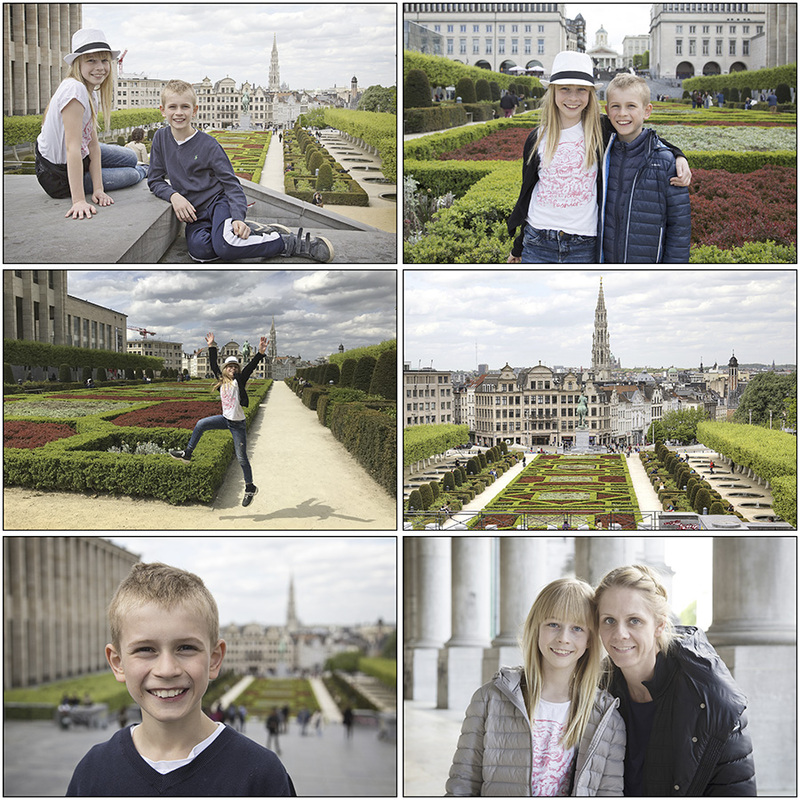 After our visit to the Atomium we went to the Grand Place, the biggest tourist destination of the city. It is the historical trading square and political center of the city and has been a UNESCO World Heritage Site since 1998. Surrounding the square are many old guild houses which are decorated with gold trimmings and carved statues. 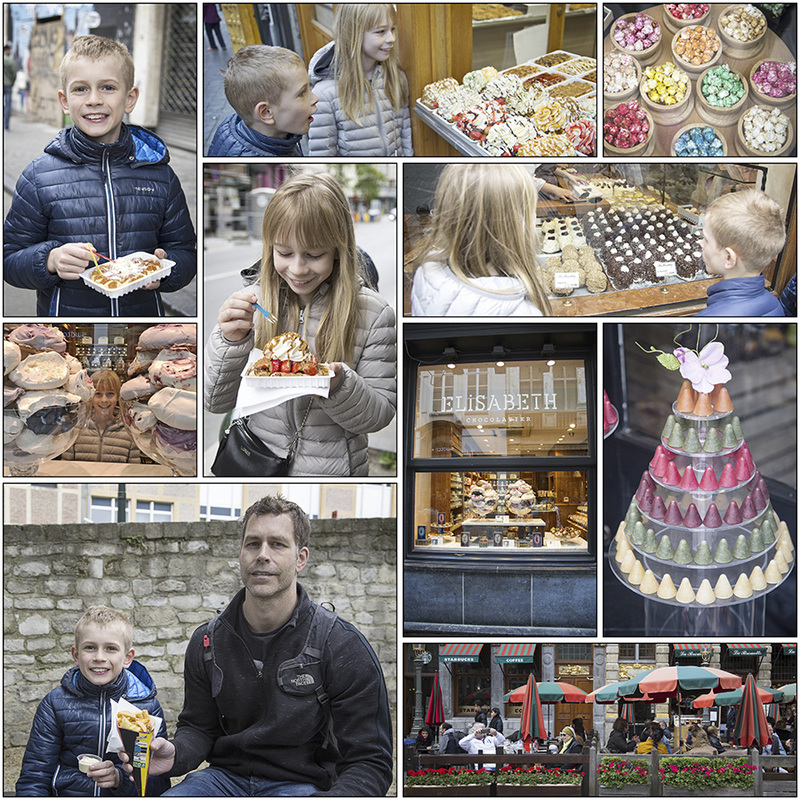 Along many of the side streets we found all kinds of Belgian treats, including waffles, chocolates, Belgian french fries, and a few other hard to pronounce delicacies. 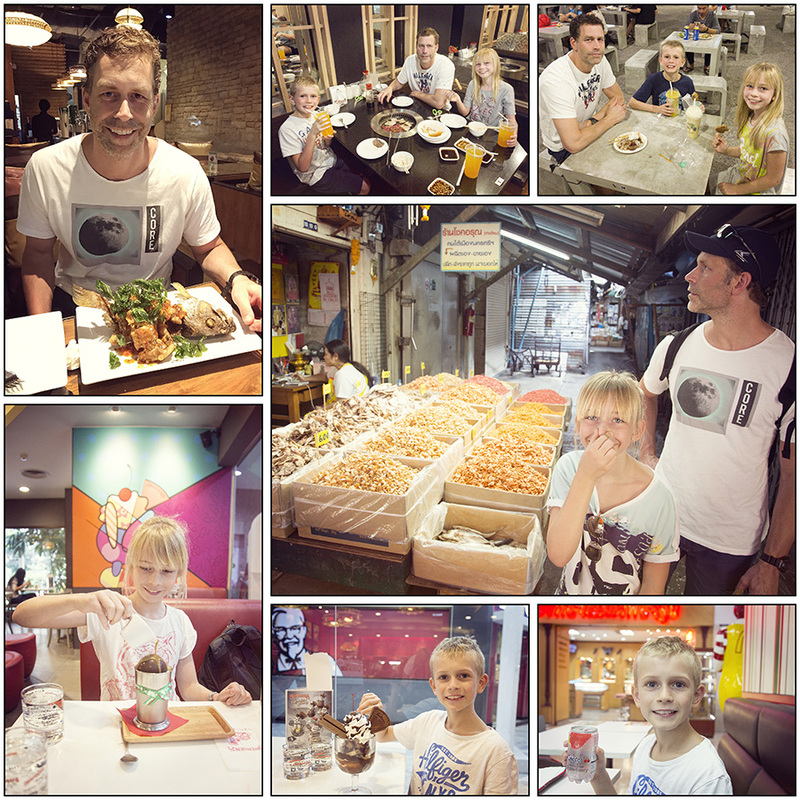 For once, the kids were eager to try out the local specialties. 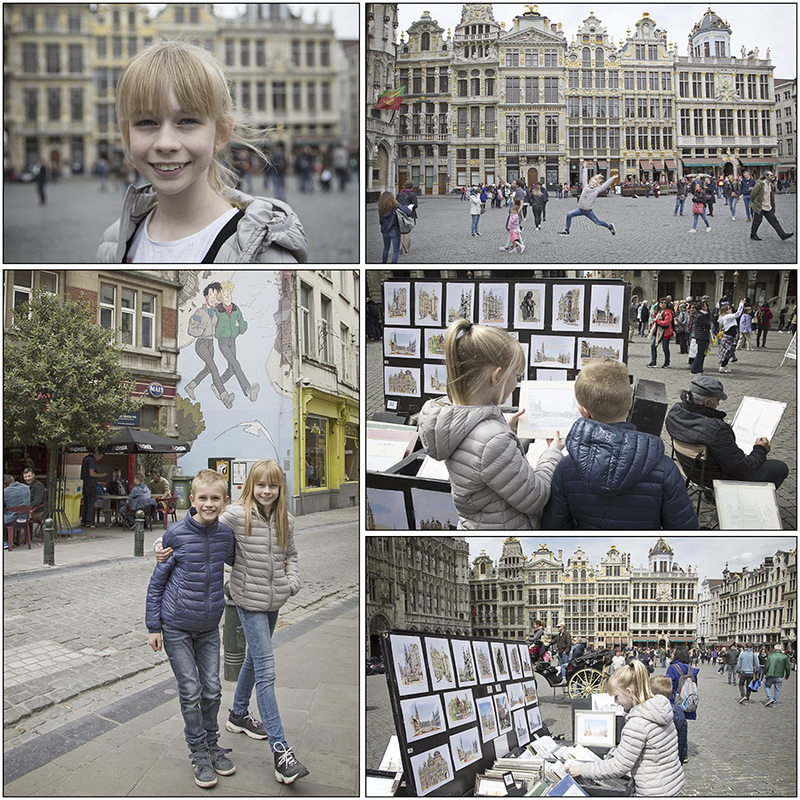 Before departing for Brussels we asked the kids to do some research about the city and find out which attractions they would like to visit. 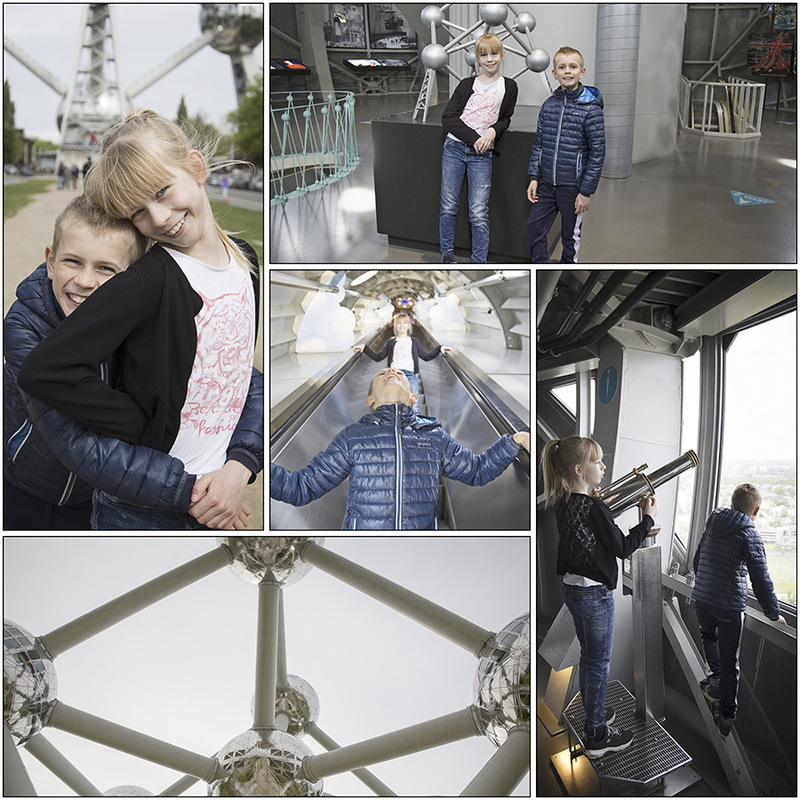 On the first day, we started early and headed to Elliots #1 destination, the Atomium. 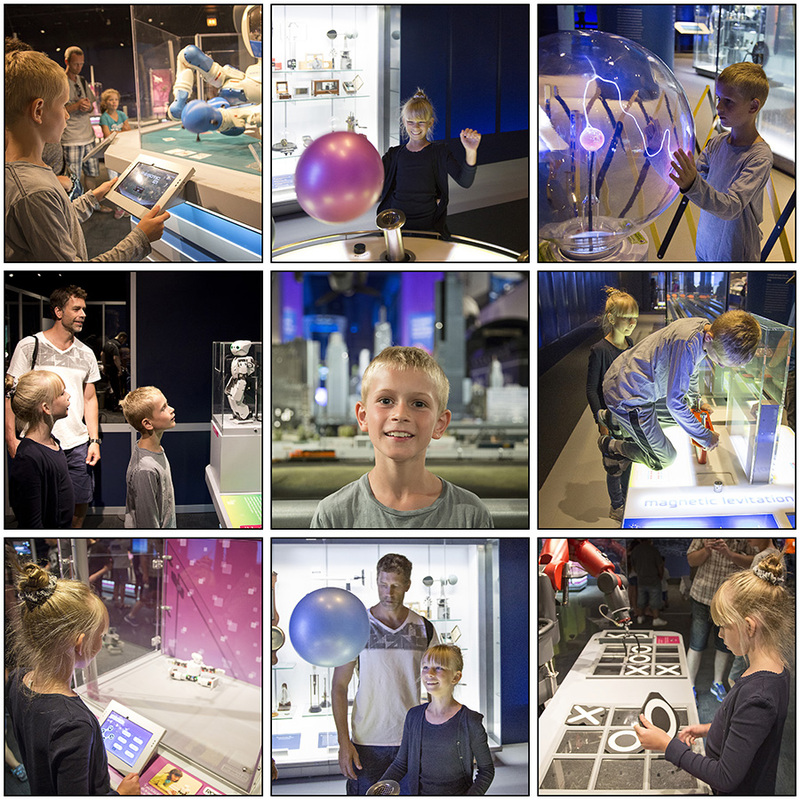 The Atomium was built in 1958 for the World fair to showcase the technological achievements made by science and industry in Belgium. 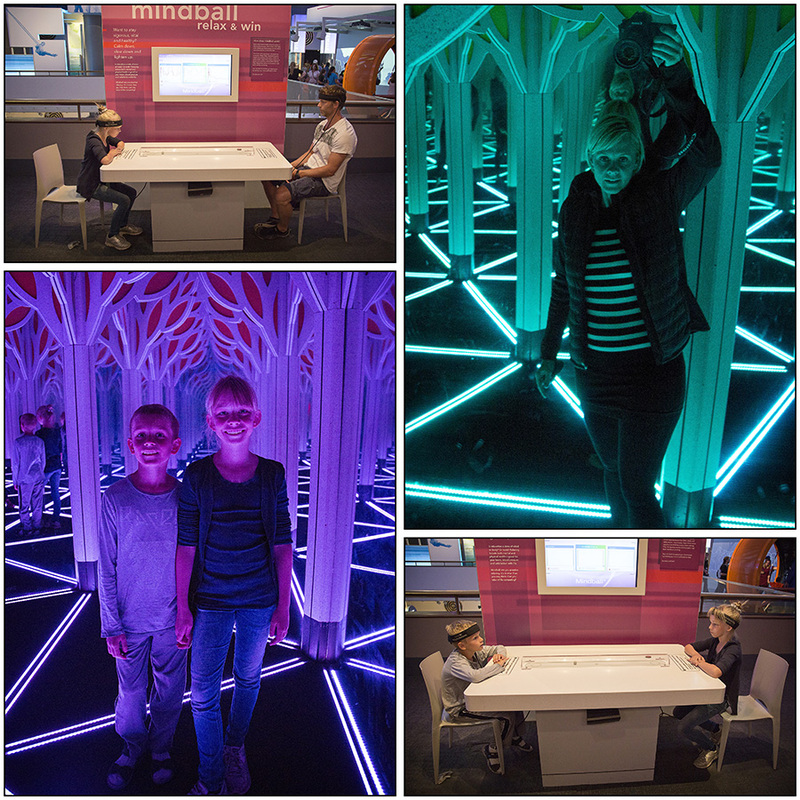 We were able to climb around in many of the spheres where different exhibitions were setup, and we got great views of the surrounding area from the top. 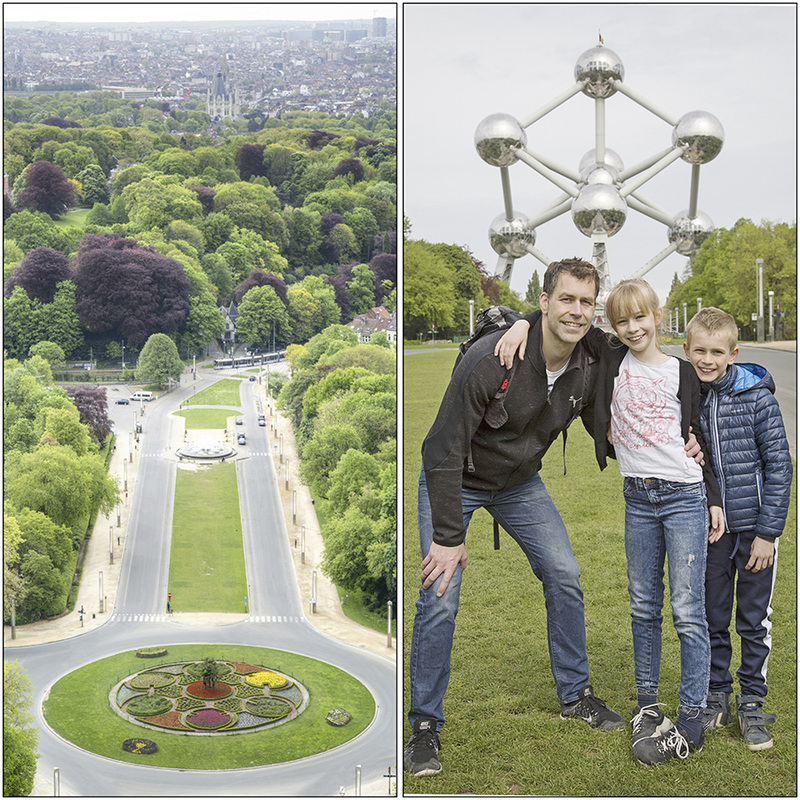 Outside the Atomium was a large park area where we walked around and experienced some of the local Brussels wildlife. 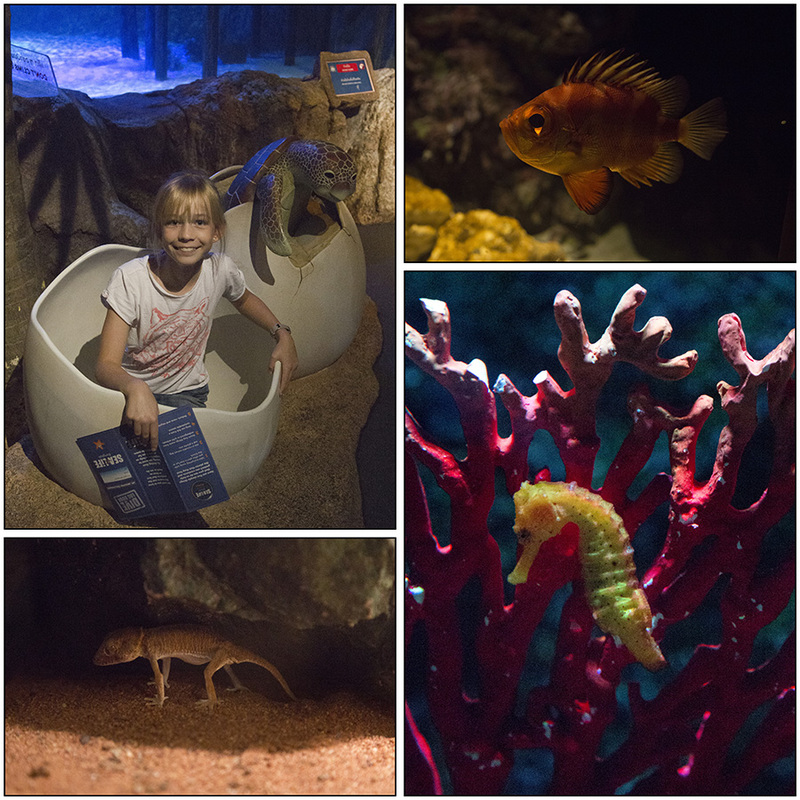 SEA LIFE Bangkok Ocean World is one of the world’s largest aquariums and this was the last stop on our trip. 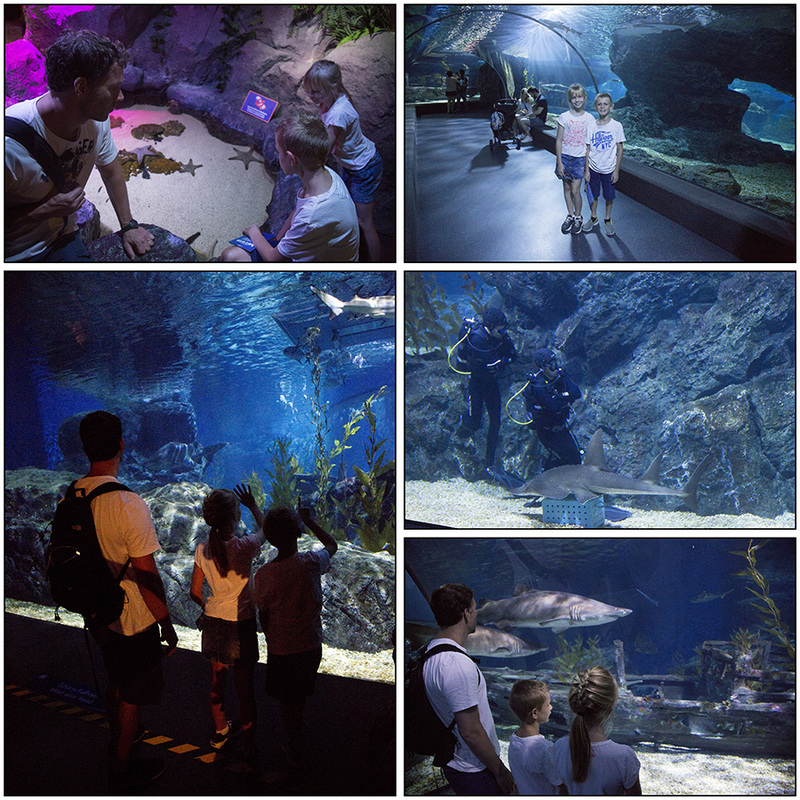 We usually always have a good experience when we visit aquariums, and this was no exception to the rule. 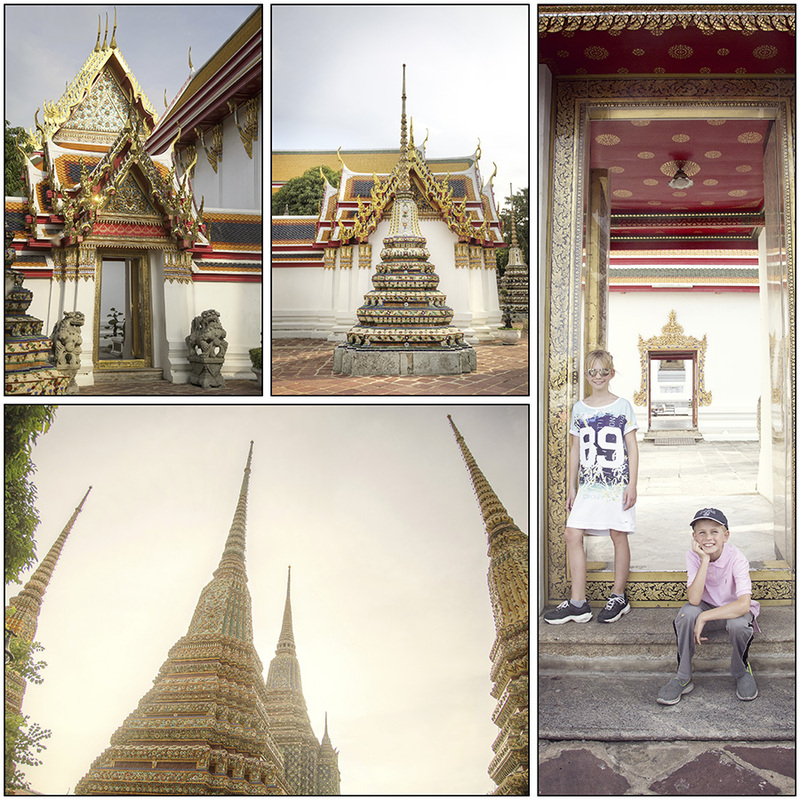 There are more than 31,300 Buddhist temples in Thailand and Wat Pho is one of the oldest, largest, and most admired ones. It is also known for being the place where Thai massage was born. 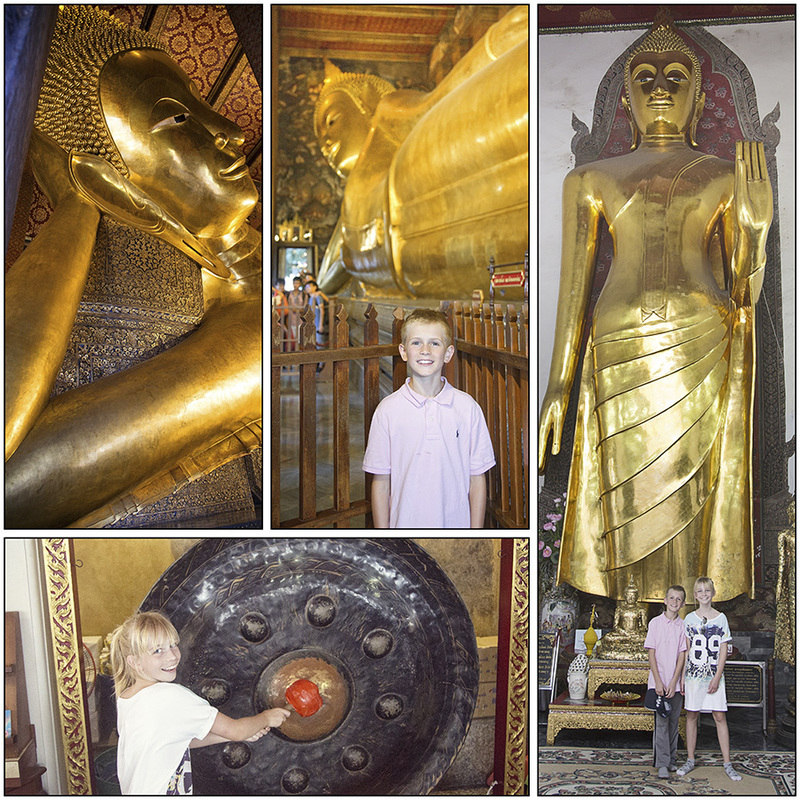 The biggest attraction of the Wat Pho temple complex is the Reclining Buddha, a gigantic golden Buddha statue, which is lying down. 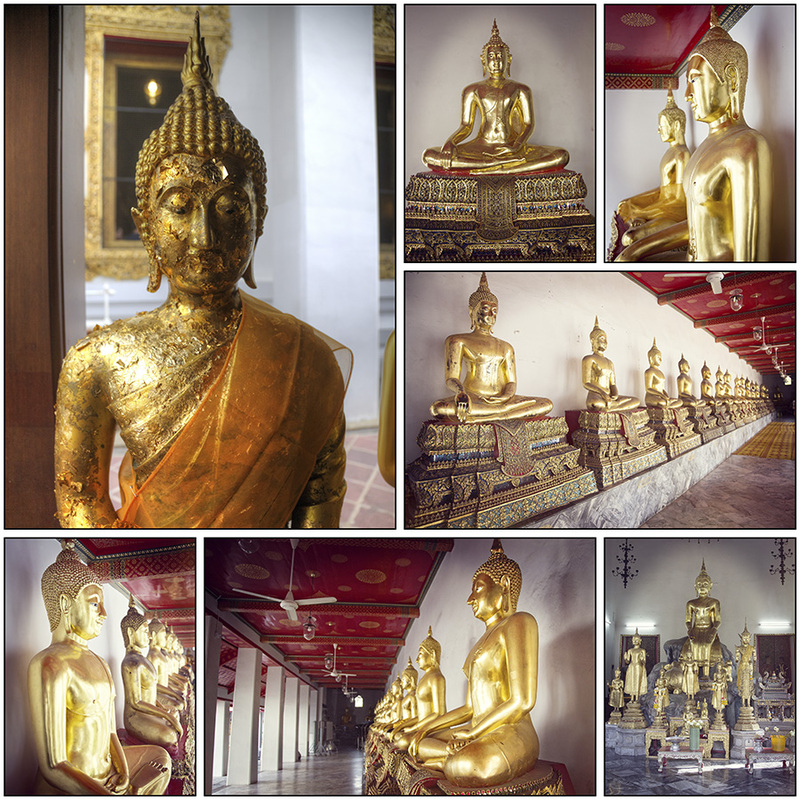 It was built in 1832 and is 46 meters long and 15 meters high, the largest Buddha in Thailand. 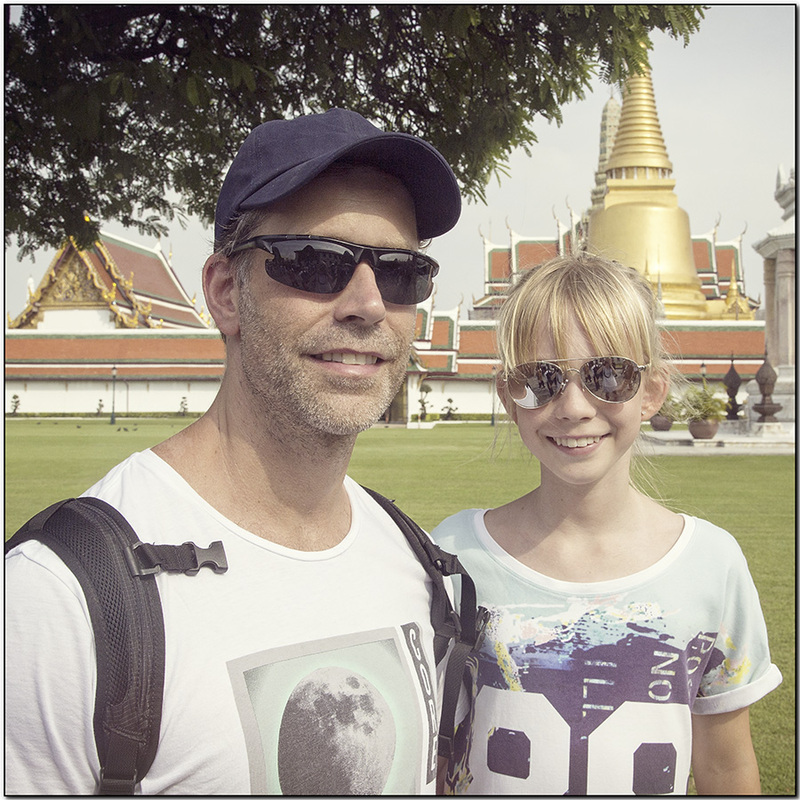 Other than the reclining Buddha, the Wat Pho temple complex houses more than 1,000 Buddhas, which is more than any other temple in Thailand. 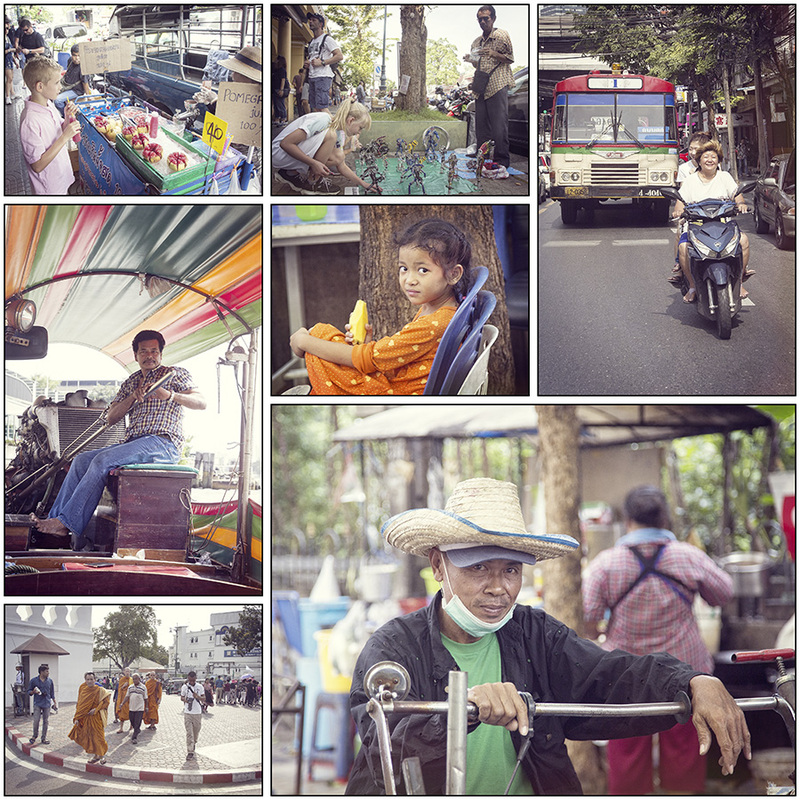 Tuk-tuks can be found everywhere in Thailand and it’s estimated that there are around 35,000 of them cruising around the streets. 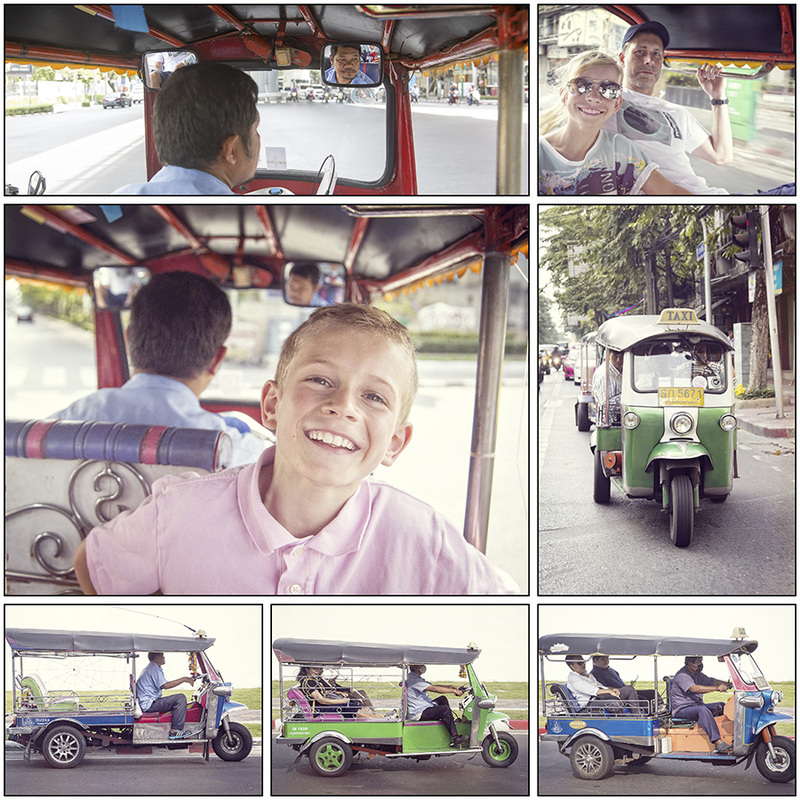 Even though the tuk-tuk drivers are infamous for overcharging and driving like mad, it’s part of the adventure to try riding a tuk-tuk. 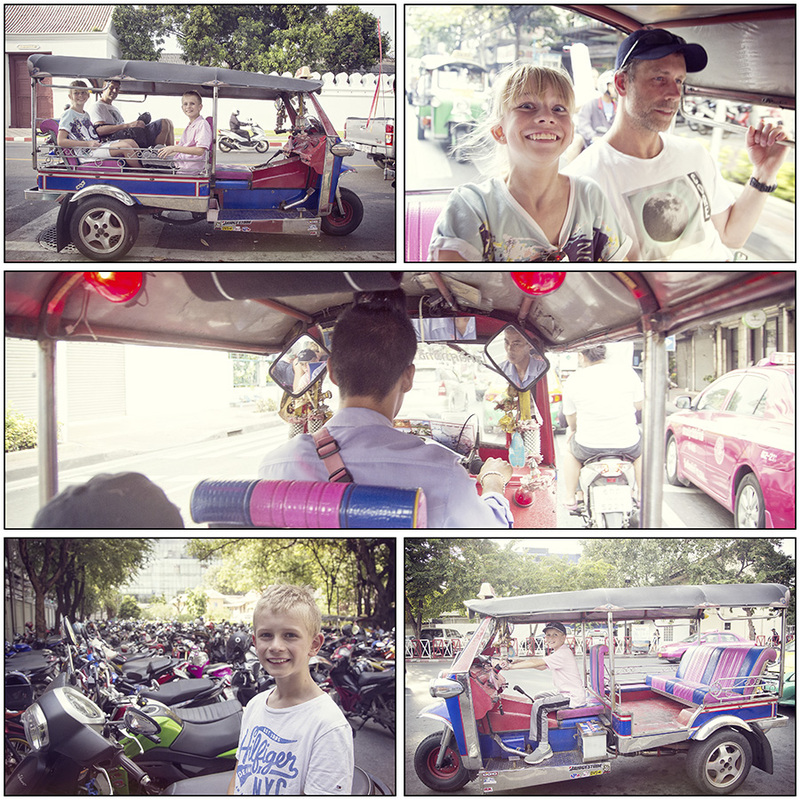 On our first tuk-tuk ride, the driver squeezed us through countless traffic jams in a steady and comfortable pace with plenty of time to breath in the hazardous fumes from the engines all around us. The next trip was with a bit more of an aggressive driver. He seemed to get a big kick out of the fact that his female passengers had some very nervous facial expressions during most of the ride. After arriving at our end destination, he invited Elliot to sit behind the wheel. 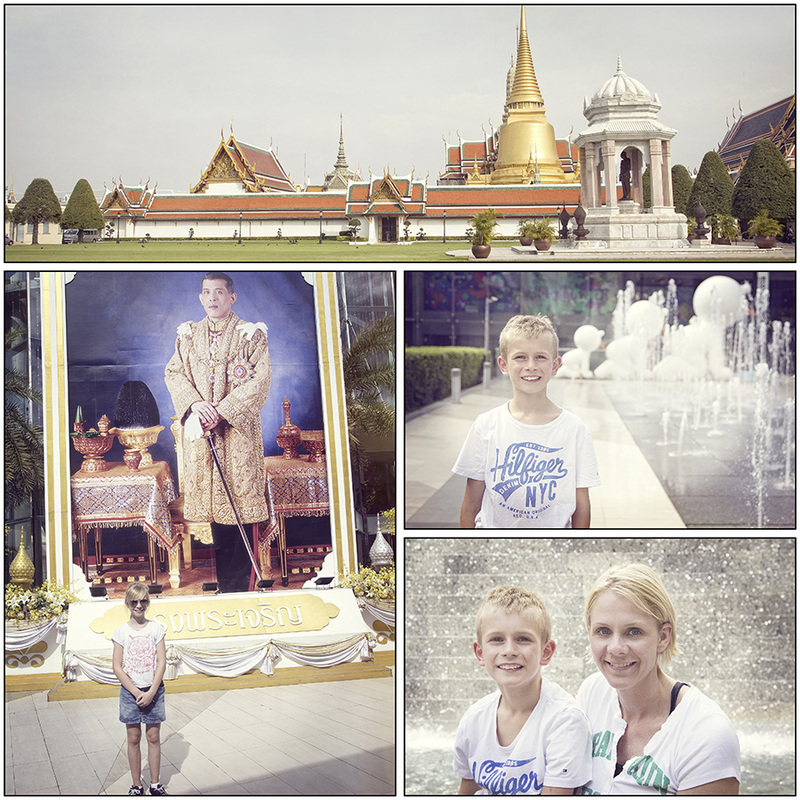 After a week outside of Hua Hin, we drove north back to Bangkok to spend a few days exploring the world’s hottest city. 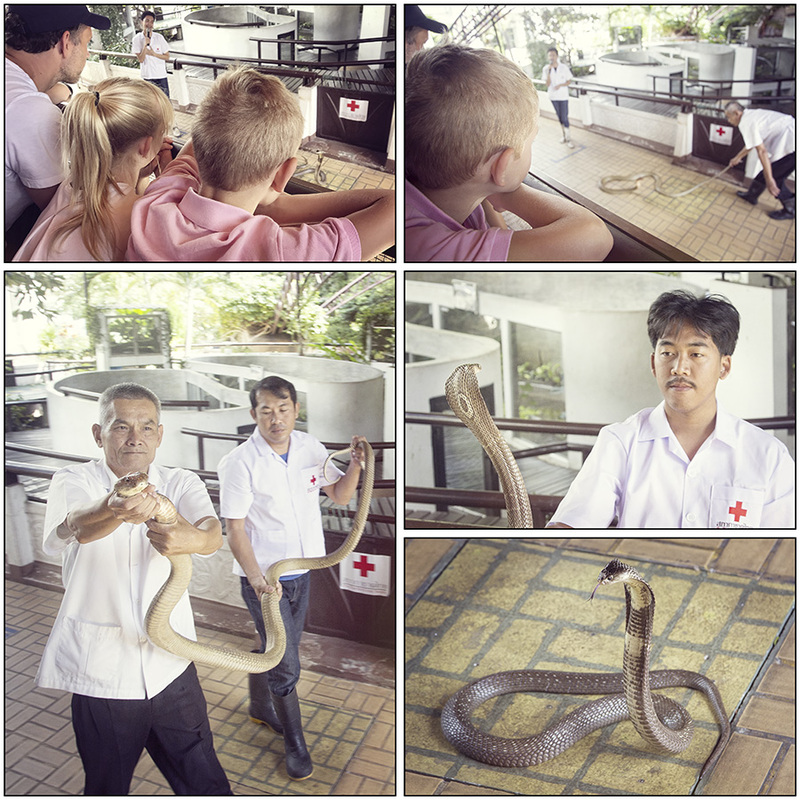 First stop was Bangkok Snake Farm which is a working snake farm where they breed snakes in order to extract venom for anti-venom production. 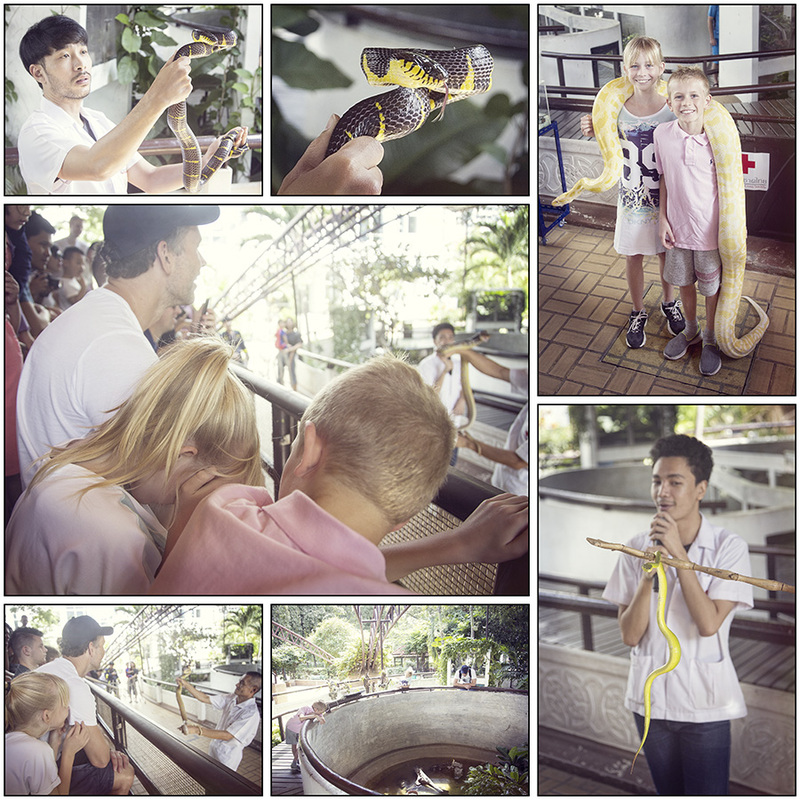 The handlers brought out around 10 different snake species and told us interesting facts about them. We got front row seats, which meant that some of the deadly snakes were dangerously close to us. We made very few visits to McDonalds on this trip, compared to what we normally do when we travel. 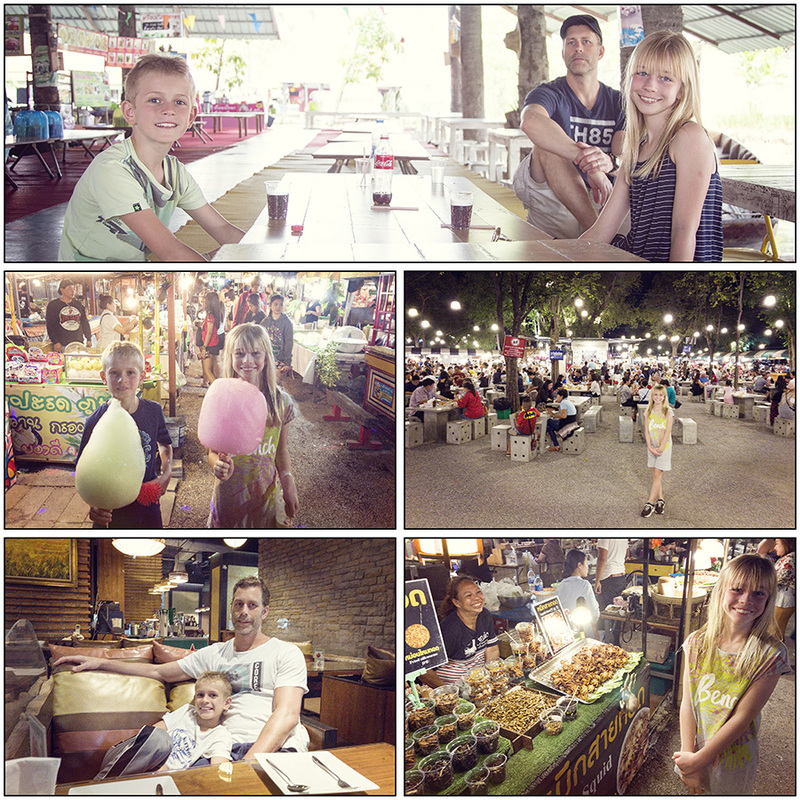 The selection of food was both very diverse as well as affordable, and for the first couple of days we even managed to convince the kids to try out some new things. Thai food has a lot of texture, colour, and good flavour. 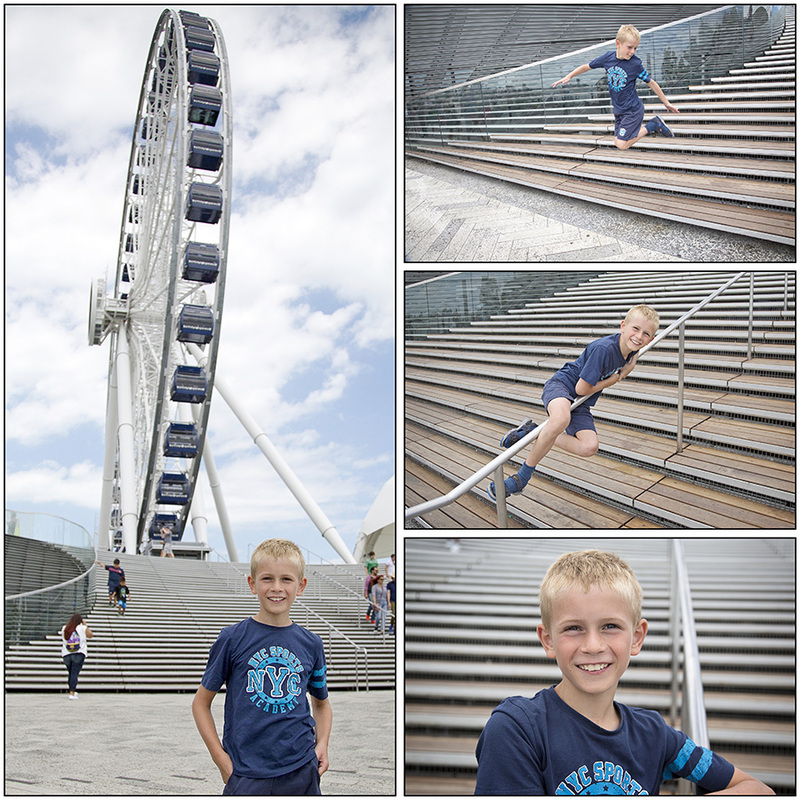 Shawn, in particular, was very adventurous when it came to trying out something new. Several of his dishes were served with the eyeballs still attached. 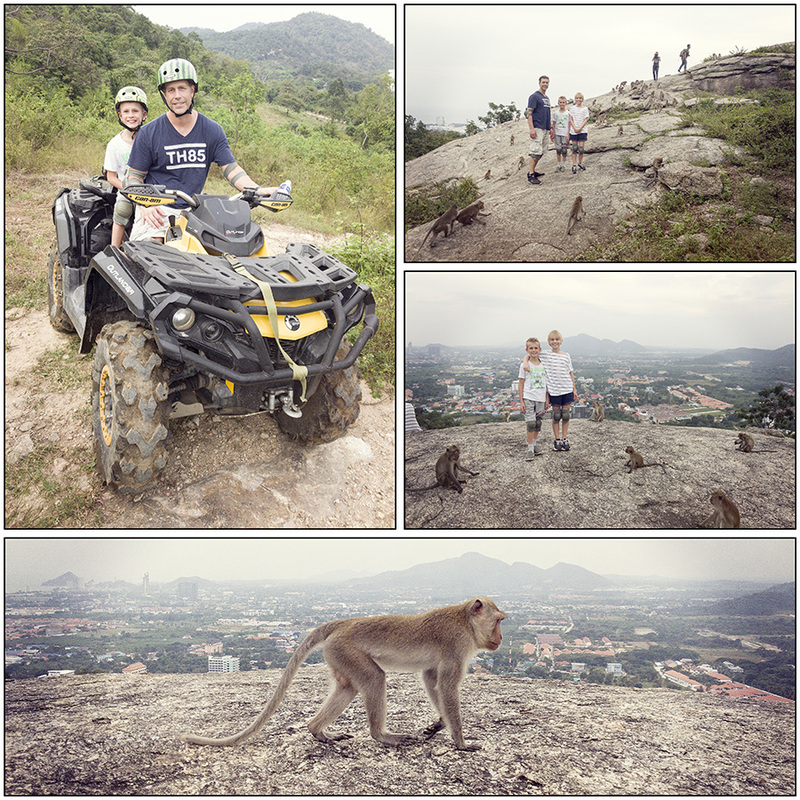 As part of an ATV ride/tour we went to the Khao Takiab mountain, also known as ‘Monkey Mountain’. Not named because the hill is shaped like a monkey, but because there are hundreds of rodent-like monkeys roaming freely. 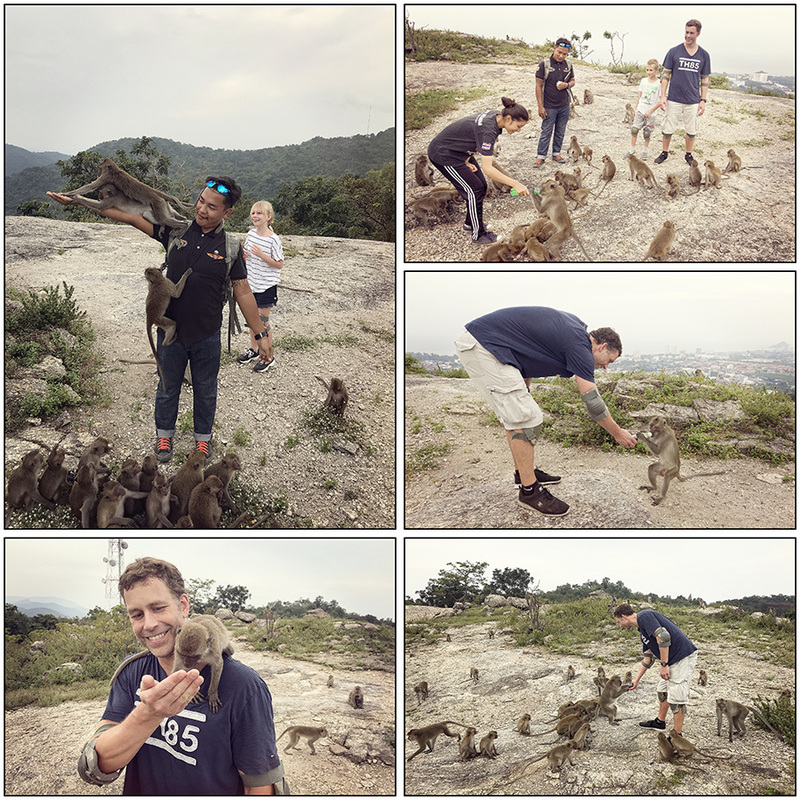 The guides had brought a bag of food with to feed the monkeys and they definitely kept after us when they found that out. 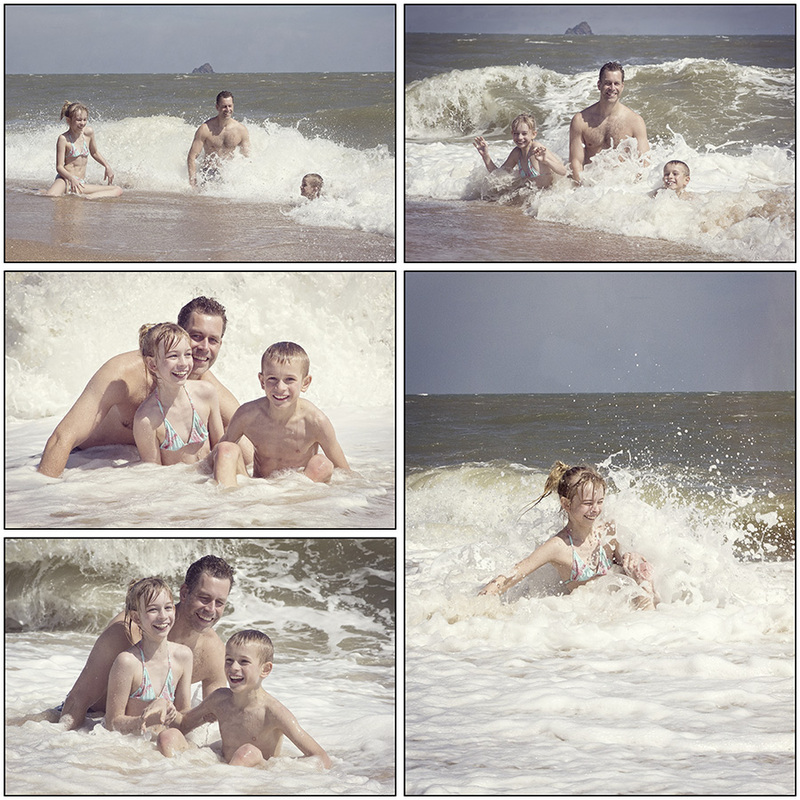 There was a lot of monkey screeches and scampering going on which at times was overwhelming. While enduring the bacteria soup and the stink from the somewhat aggressive macaque monkeys, we got to enjoy a really nice view over the area. Once the food was gone we headed back down to leave the monkeys for the next set of tourists. 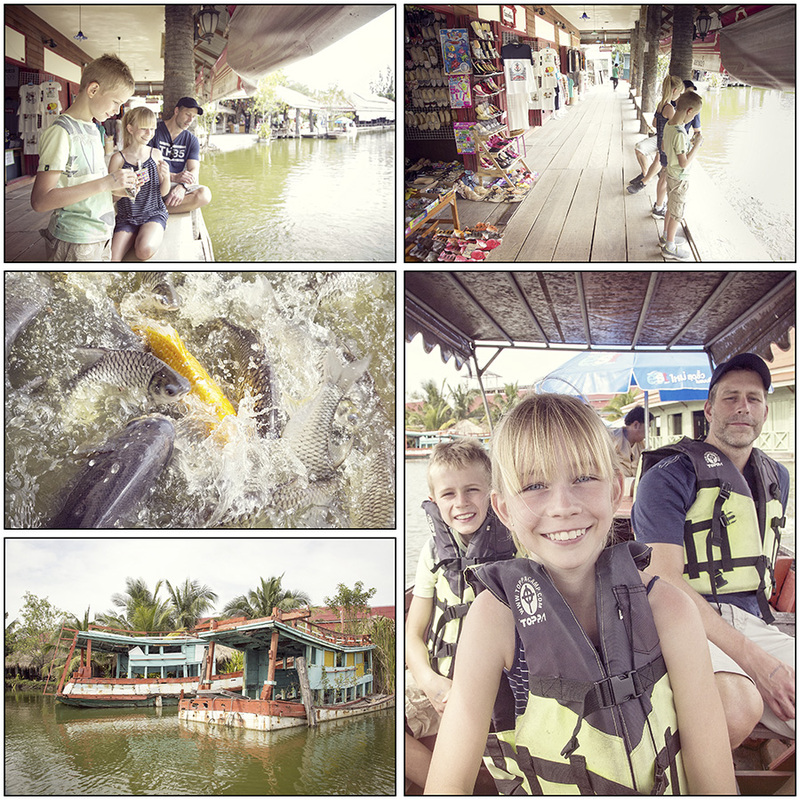 The Hua Hin Sam Phan Nam Floating Market has a lot of bad reviews on Tripadvisor, and rightfully so. It’s not a floating market at all, just a bunch of souvenir shops on a raised platform around a man made lake. Being foreigners, we had to pay an entrance fee to get in to the market and potentially do some shopping. This fee also covered a 5-minute boat ride in a very noisy old boat where we got to rush by all the shops that we had just walked by. 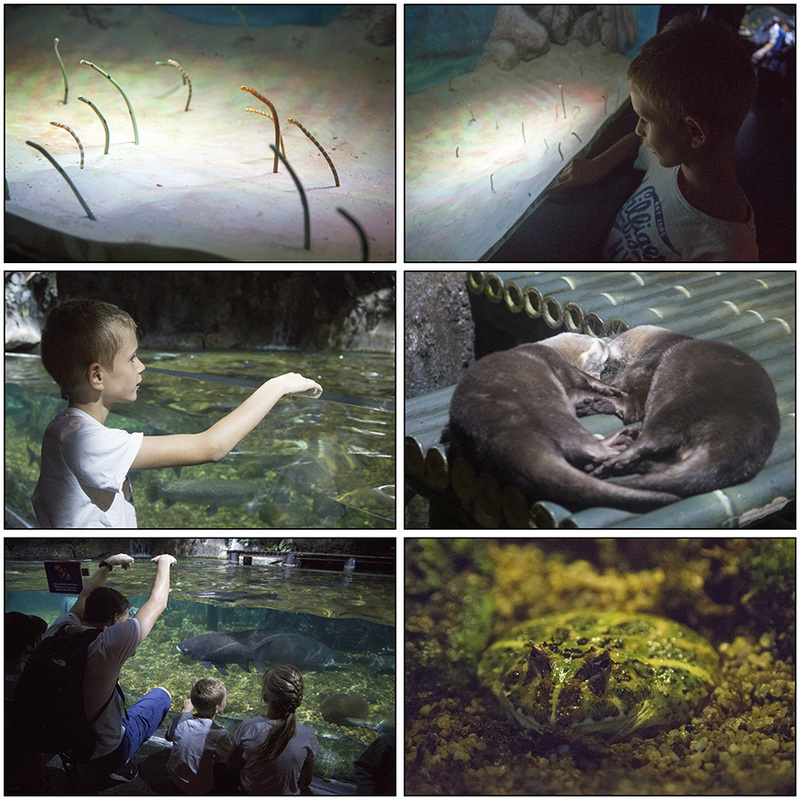 It was so bad that it was funny, and the kids had a good time patting some goats and feeding the fish. 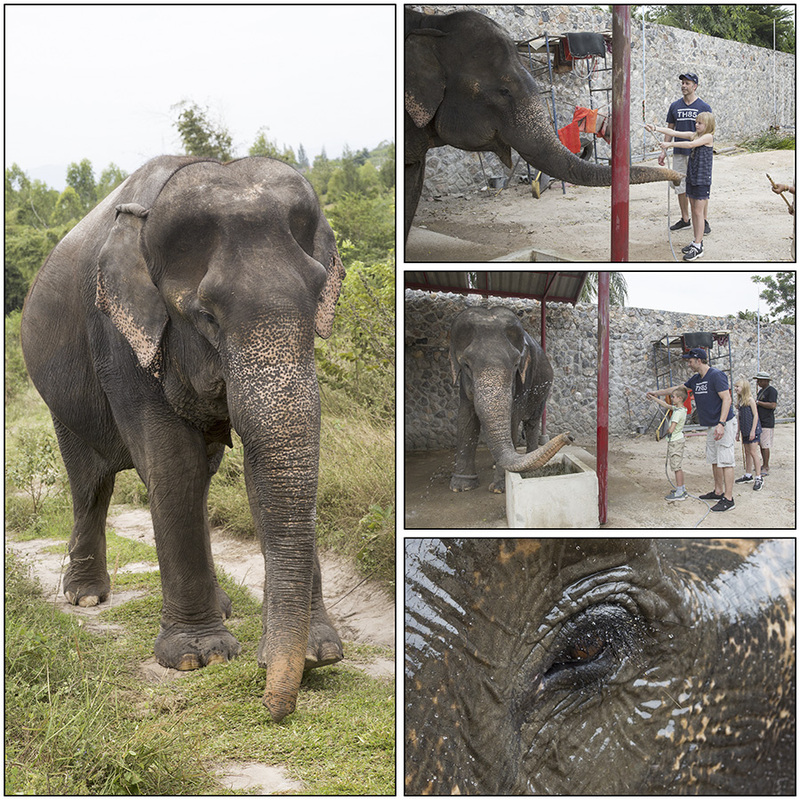 One morning we made our way to the Hutsadin Elephant Foundation. This is a place which provides care and support for Elephants who suffer from ill health or have been abandoned by their owners because they are unable to work any longer. 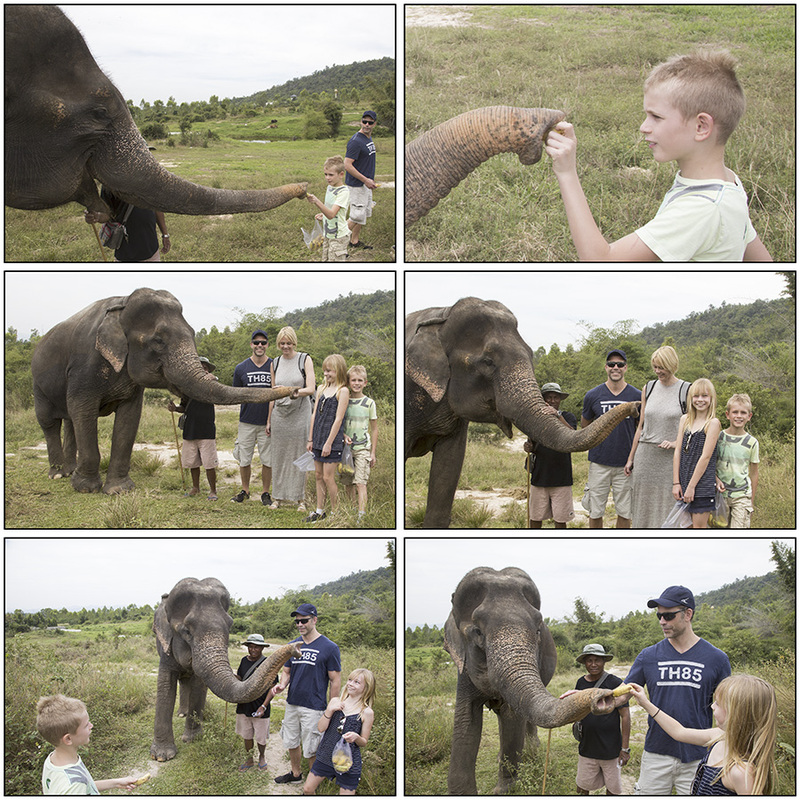 We took an elephant for a little walk and the kids each got a bag of bananas, which they fed to the elephant along the way. Upon returning from the walk, the kids hosed down the elephant. 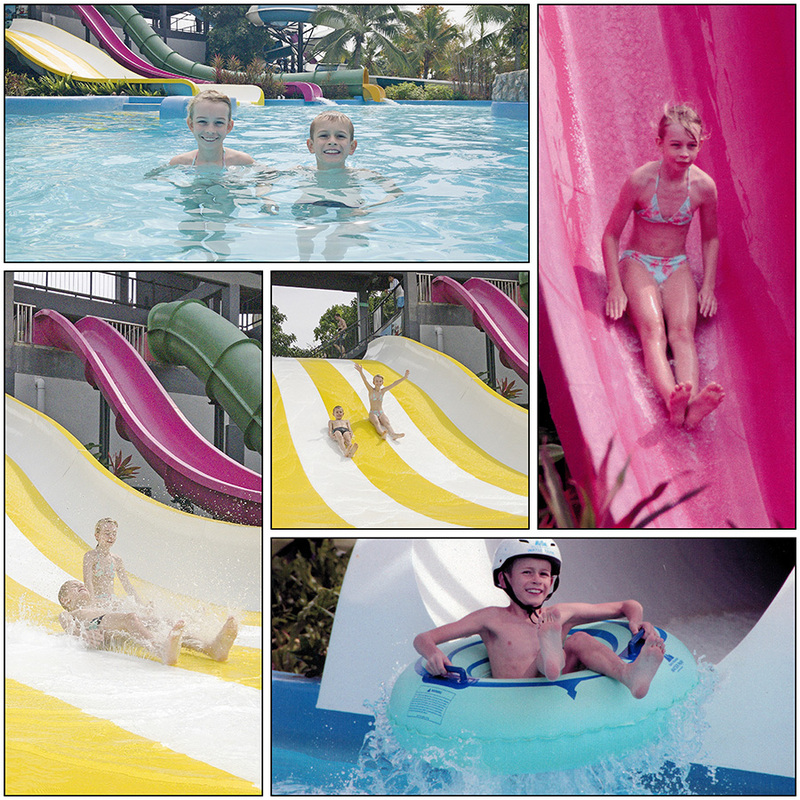 Winter in Thailand is not comparable to the dark and cold winters that we are accustomed to. 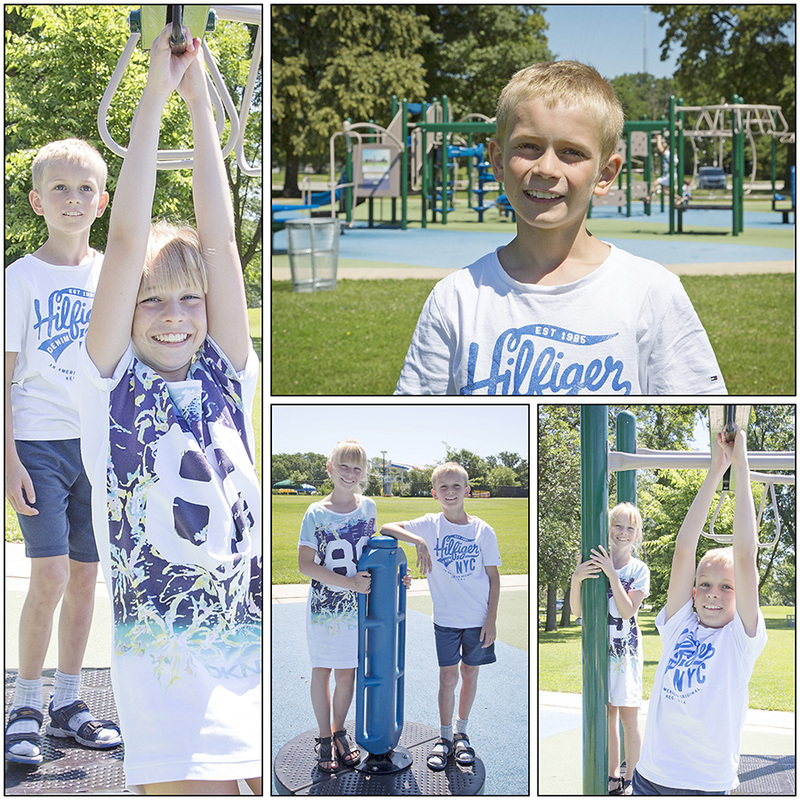 During the cold season from November to April, temperatures are fairly constant around 30 – 35 °C. 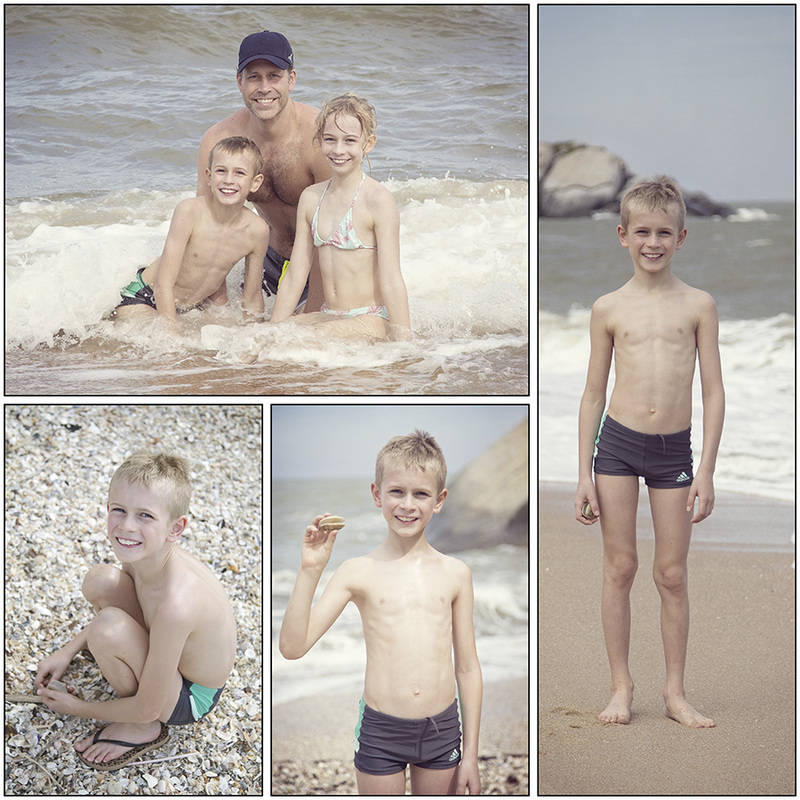 We made sure to exploit the nice warm weather by making many trips to the ocean and to various pools. 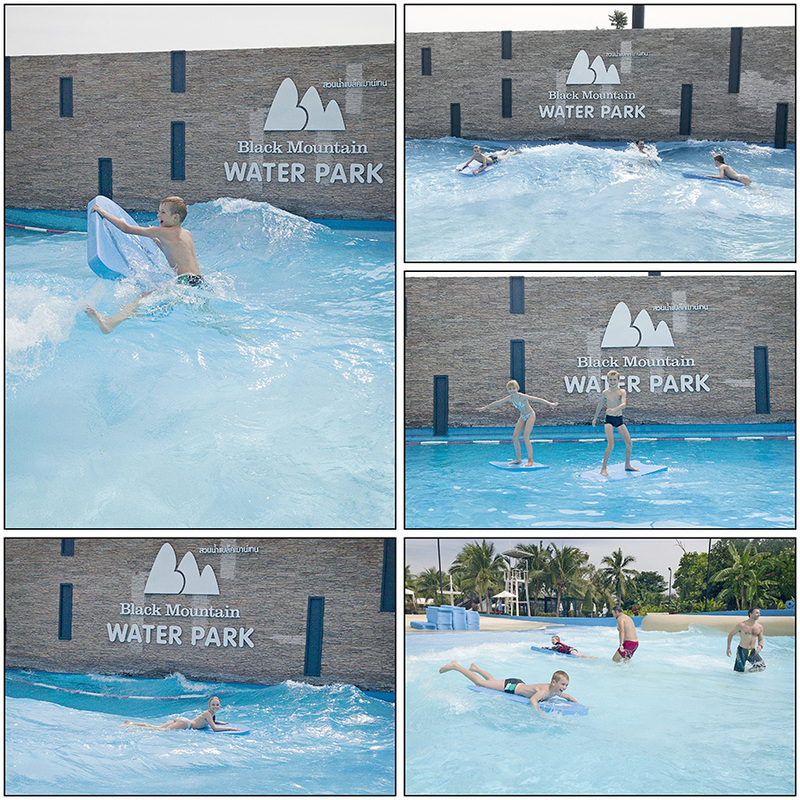 We also spent a day in a water park. 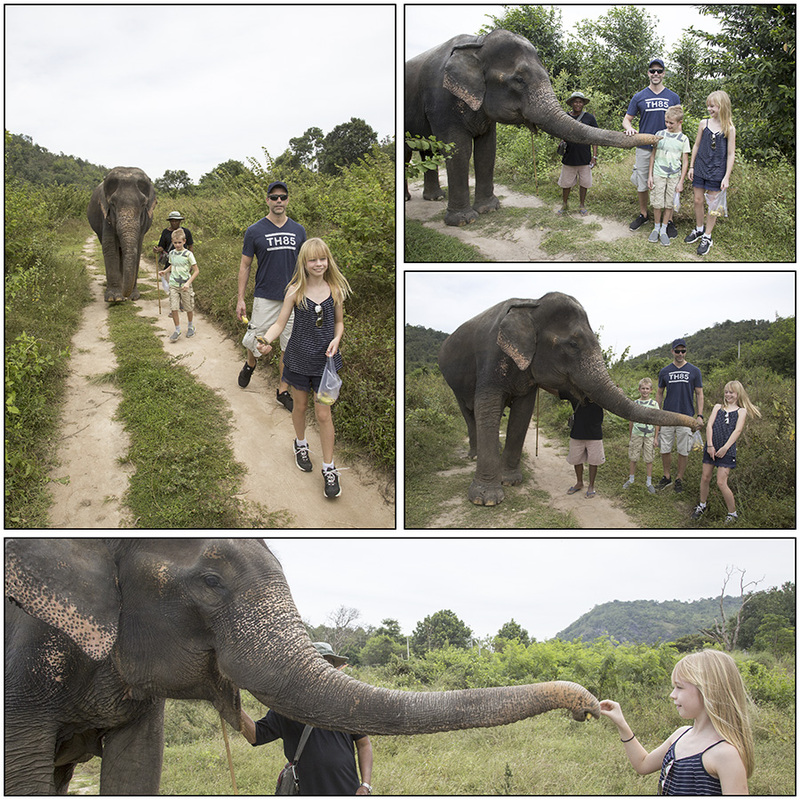 One of our first trips in Thailand went to Pran Buri National Park. 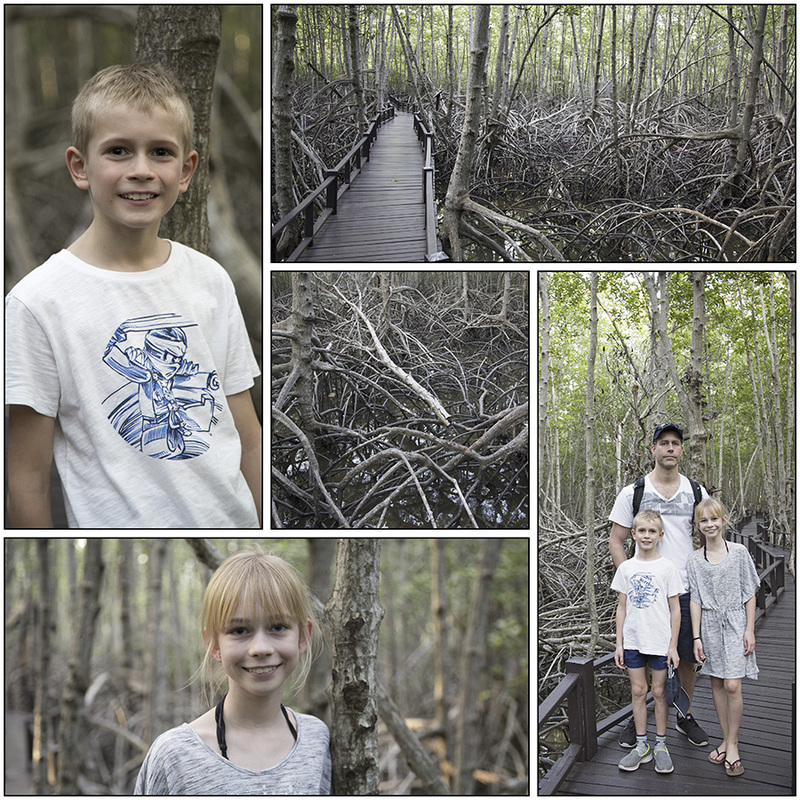 Here, we took a stroll on a 1 km long wooden boardwalk that crisscrosses through a dense mangrove forest. The Pranburi River winds through the forest and along the trail you could rent a long-tail boat. 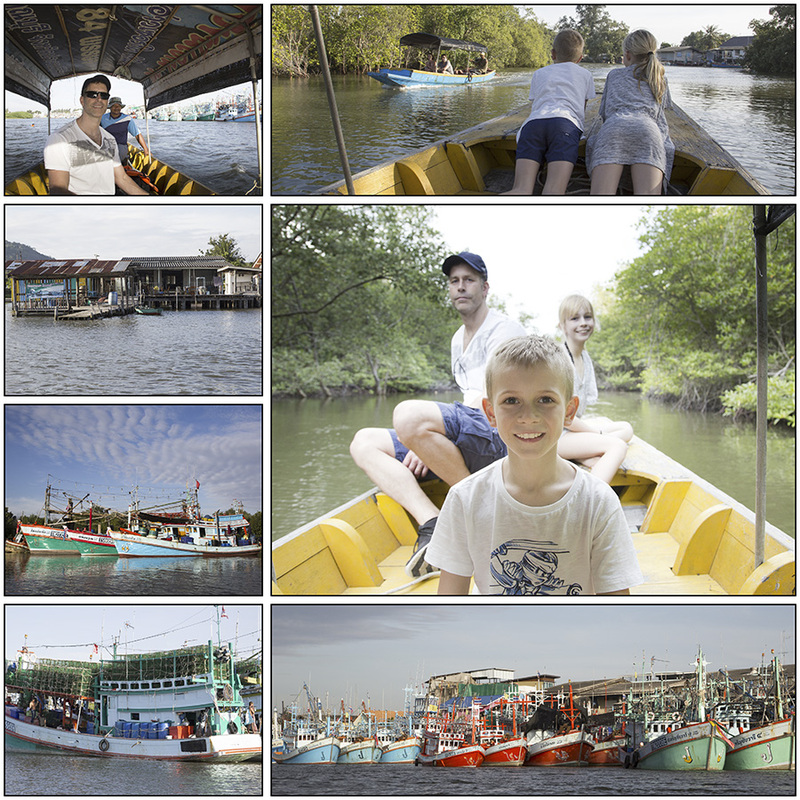 We did a tour of the river passing a small fishing village and spotting a lot of colorful fishing boats and a big Monitor Lizard on the way. On Thursday the 23rd of November 2017 we boarded a plane heading from Copenhagen to the Suvarnabhumi Airport in Bangkok, Thailand. 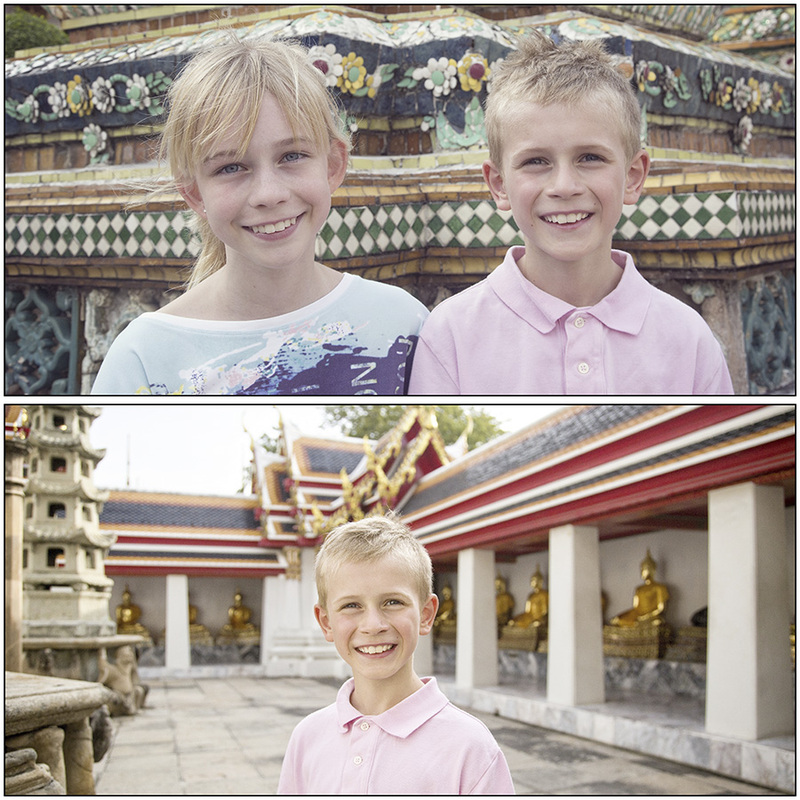 We arrived in Bangkok the following morning and after a long wait at the rental car agency we finally got our car. We drove 225 km south and shortly after passing through the city of Hua Hin we arrived at Villa Vista, a little “Swedish village” in Thailand. Our villa was conveniently located right next to the pool, so the kids quickly pulled out their swimming gear and jumped in. 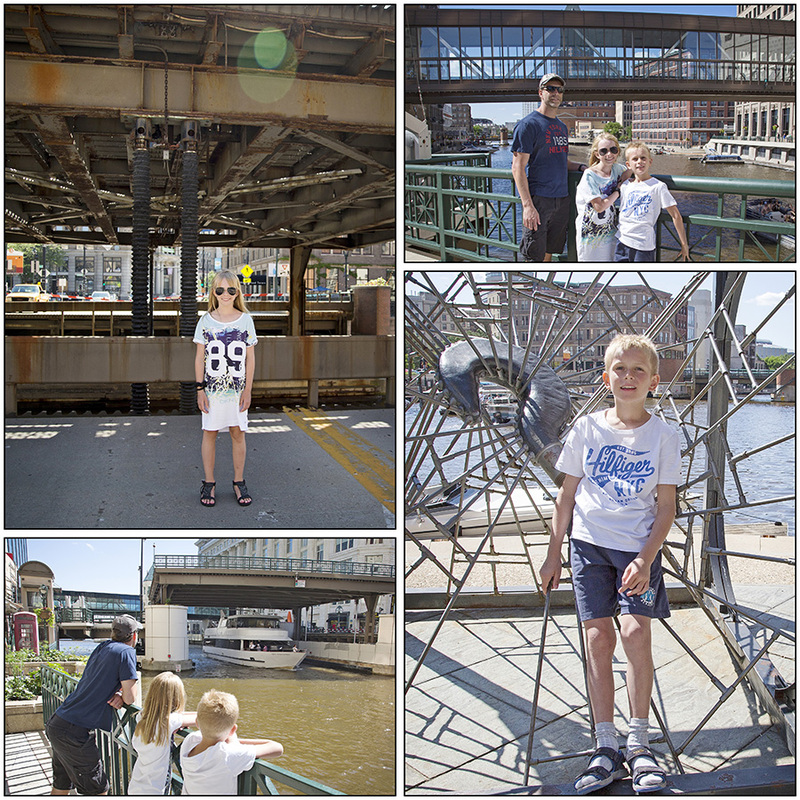 In Chicago we hit the ground running with a family bike tour along the lakefront trail when we first arrived. 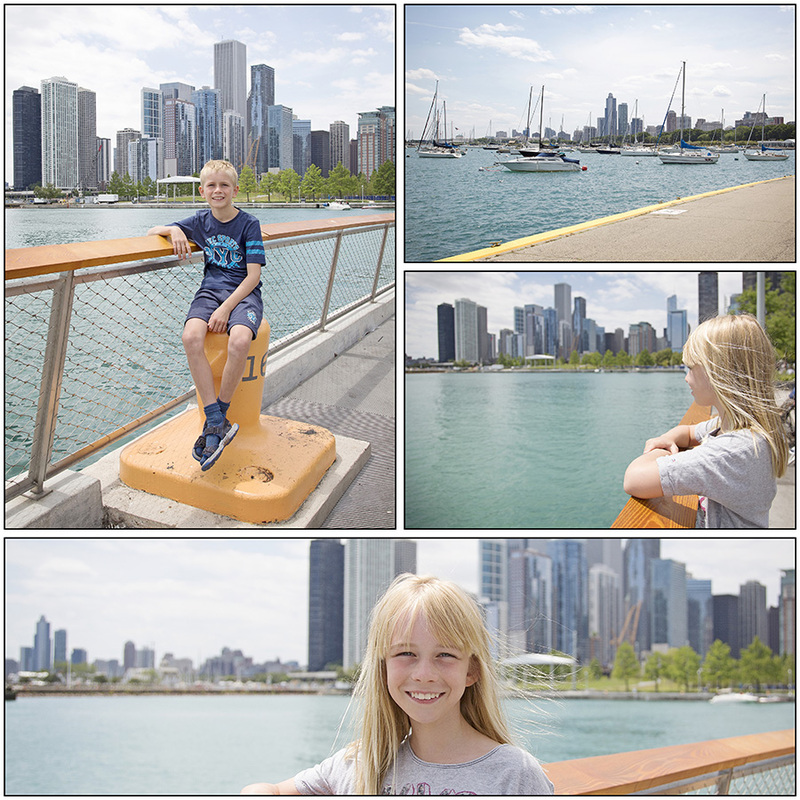 We drove down to Navy Pier and then back to Millennium park. After the bike ride we did a walking tour of the park and saw some cool sculptures as well as the mandatory Cloud Gate. It was a pretty hot day again so we were happy to finally rest our feet in a nice hotel and take a break before doing a bit more exploring downtown. We found a nice Thai restaurant that was not too busy and had a great dinner. The next day we packed up and headed to the museum of Science and Industry which had some unique exhibits. The favourite was the mind control game where you had to push a ball using the alpha waves generated by your brain. Theoretically these waves should be generated when you are in a relaxed state so the winner would be the person who could relax the most. After a few rounds the undisputed champion was Elliot who beat all of us with not one loss. After the museum we continued our road trip as we headed back towards Canada. 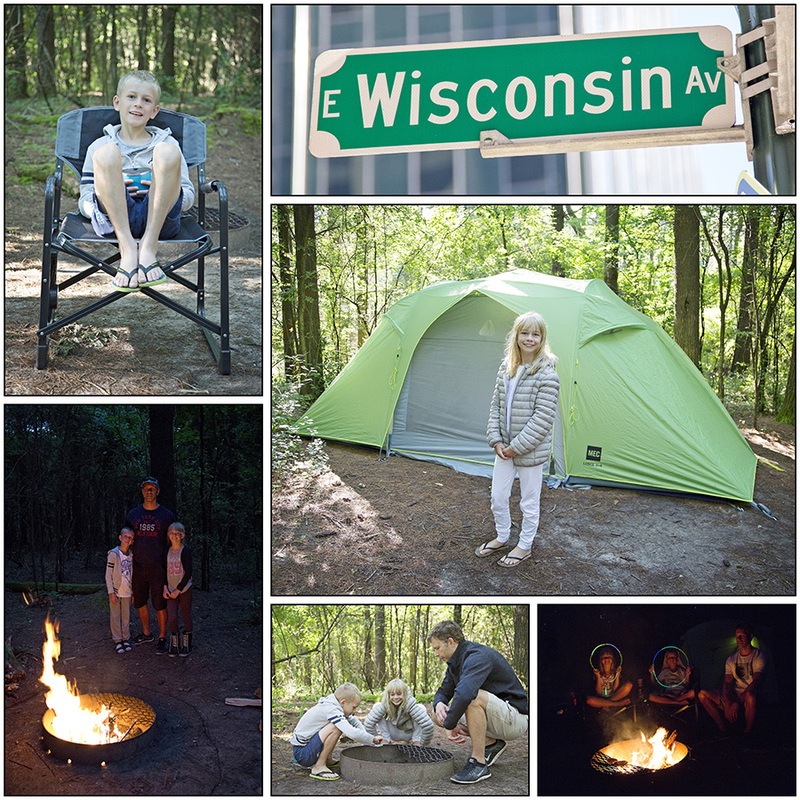 Since we had all our camping gear with us we decided to try out another couple nights of camping in a Wisconsin state park. 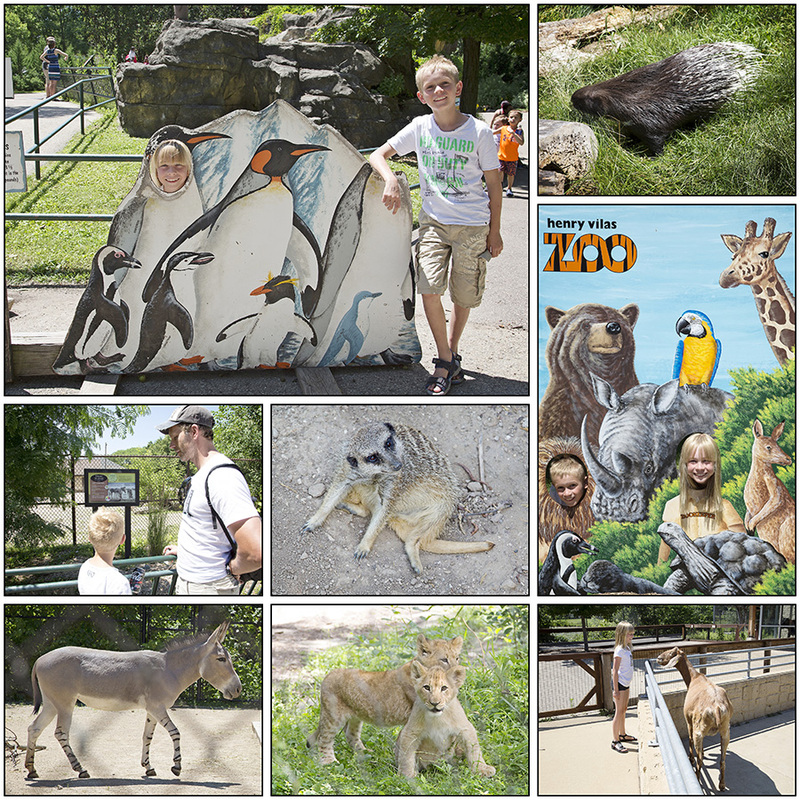 Along the way to the park we took a driving break in Madison (capital city of Wisconsin) to visit the Henry Vilas zoo (which is one of the few free admission zoos in the US). 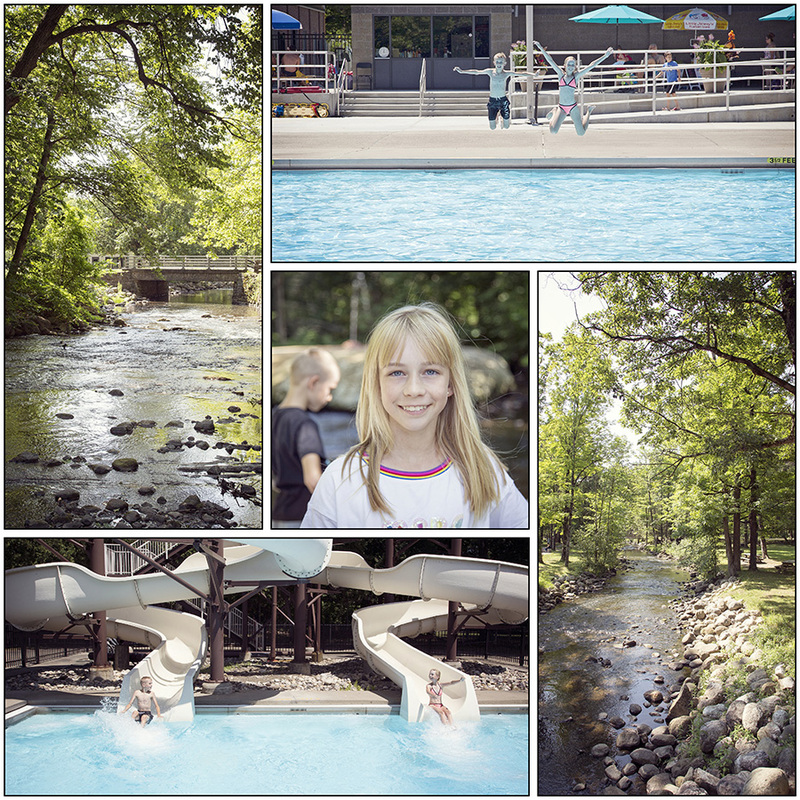 After the zoo we continued to the campsite which was about a 40 minute drive outside of Milwaukee. 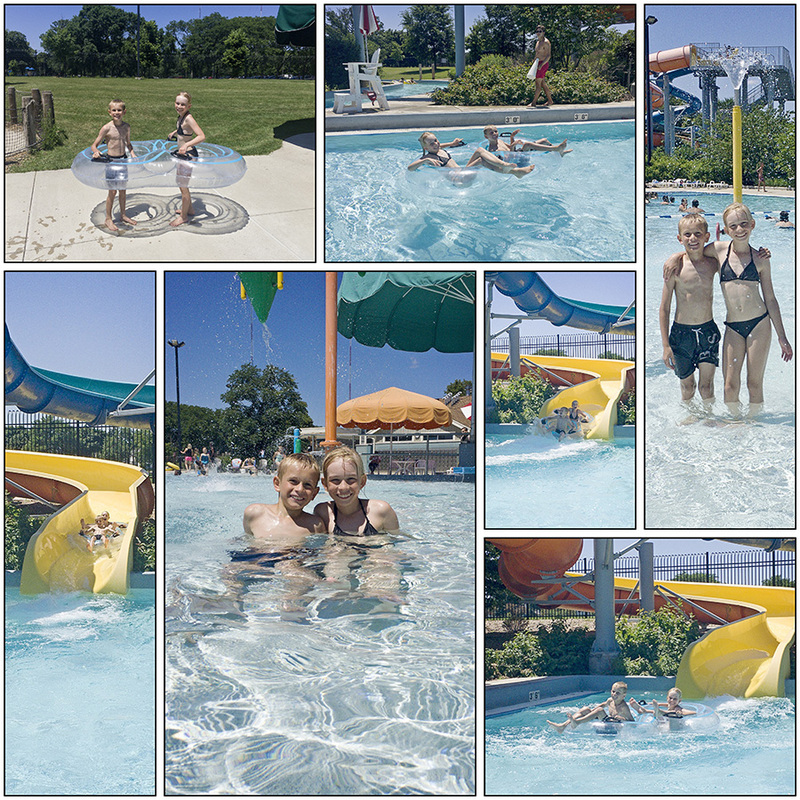 The next day we took a day trip to Milwaukee to visit a water park and afterwards we went downtown to do a tour of the city. 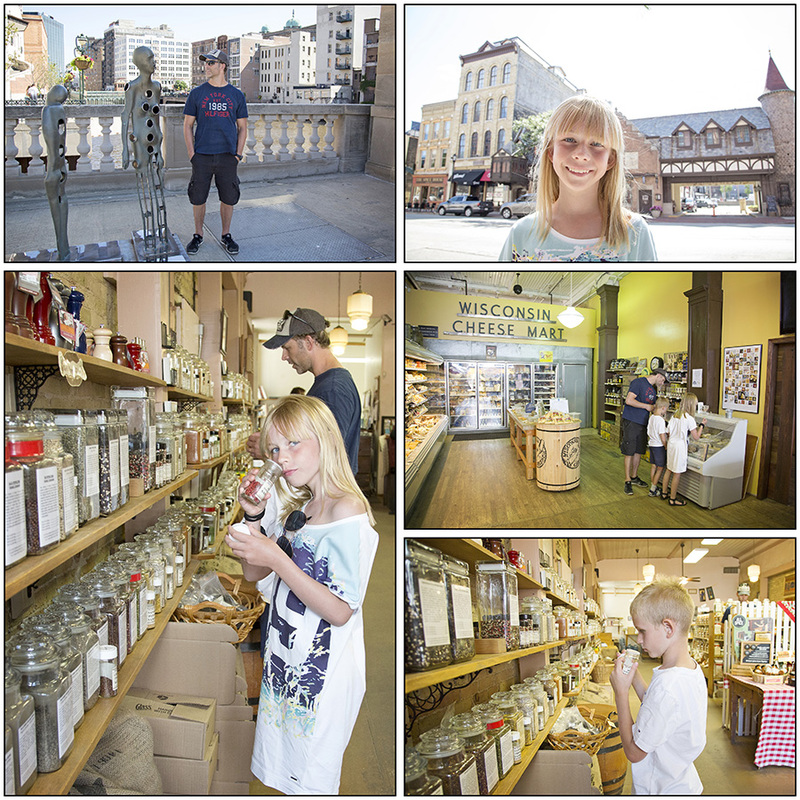 We sampled some of the historic areas by the riverfront, visiting an iconic cheese store and a spice store. After a long day of playing in the water and sightseeing we drove back to the campsite for our last night before our next destination.